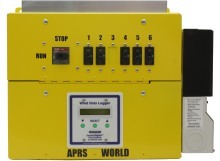 The Turbine Control Panel provides a safe, easy, compact, and economical balance of system for APRS World's WTAPRS wind turbines. It integrates three phase turbine run / stop switch, three phase bridge rectifier, DC distribution and over current protection, dump controller, and data acquisition / telemetry equipment ... all in one box! The Turbine Control Panel has nearly limitless configuration options.